Today is the first day after the Pie and I finished our month-long vegetarian experiment. Accordingly, we’re going to MEAT IT UP and have ourselves some burgers tonight. So much for easing back into omnivorism. There are two very important things to remember when making burgers by hand. 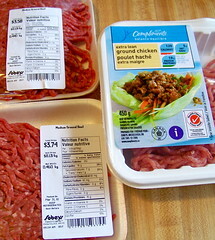 The first is to buy no leaner than a medium ground chuck. You may think you’ve made a healthy choice with a leaner ground but your burger will not stick together and will crumble as it cooks. The second is to touch the meat as little as possible, which is quite a feat considering you need to hand-form the patties. But it is doable, and making your own burgers really isn’t that hard. There is a third thing you should know about burgers: KEEP IT SIMPLE. Remember that you are frying or grilling up some ground meat, which, as it cooks, will secrete slippery oil and will shrink into individual particles. This means that cohesiveness is an issue when making burgers, which is why you don’t touch them too much or get too rough with them. 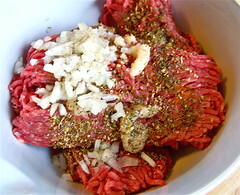 The more stuff you add to the chuck before forming it into the patty, the more you risk a crumbling burger. If you’re going to add things to the meat, make sure they’re small things so they don’t mess with the burger’s internal structure. So you take your meat. We made some of these patties out of medium ground beef and others from ground chicken. I like to leave it out of the fridge for a while because you are going to be working it in your hands and manipulating cold ground meat feels like sticking your hands in the northern Pacific in the winter (which I have done and don’t recommend). 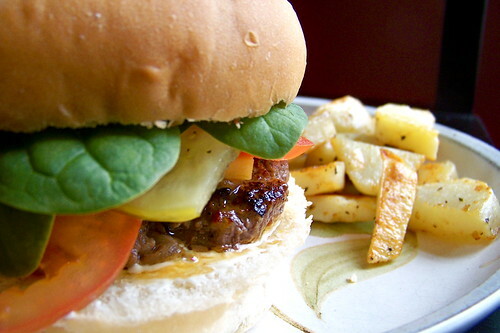 The amount of meat you use depends on the number of burgers you want, obviously. We find a kilo of ground makes about 9 3-inch patties. Put your meat in a large bowl that you can easily get your hands into. Remove your rings and roll up your sleeves. This is going to get gooey. Finely (and I’m talking FINE) dice a medium onion and chuck that in with the meat. Add a few teaspoons of minced garlic from a jar, and a few sprinkles of dried oregano and basil (or any herb of your choice) and a pinch or two o f sea salt and ground pepper. If you’re feeling adventurous you can add a few splashes of Worcestershire sauce and/or Tabasco sauce. Don’t go too crazy with your ingredients, because you need the meat to be able to stick to itself as it cooks. If you have no confidence in your patty cohesiveness, or if you have ignored me and purchased lean ground beef, you can add an egg or two, but I think that’s cheating. Eggs are useful in meatloaf, but they don’t really belong in burgers. ON burgers, but not IN burgers. Working quickly, mix the meat with your hands until all your ingredients are just combined. Grab a han dful of the mixture and pat it gently into a patty about the size of your palm. Make a thumbprint indentation in the centre of the patty and set it aside. The indentation will keep the patty from contracting too much as it cooks. Repeat until all the meat is gone. You can freeze your patties for use at a later date. 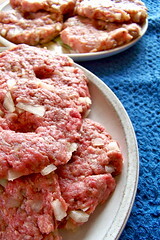 Simply separate the patties with wax paper and place them in a freezer bag, tightly sealed, with the air removed. Heat a large skillet with a bit of olive oil (or a grill, or even a broiler) and get those patties on there. Once the patties are on the hot surface, you leave them the hell alone. You may flip the burgers, but you can only do it ONCE, usually about five to ten minutes into the cooking, depending on how well done you like your meat. Safety-wise, your burger should be cooked to an internal temperature of 160°F. If you like cheese on your burger, put a few slices on after you have flipped the patty and they will melt into the meat. Serve on a bun of your choice with the toppings you like. Very much a crowd-pleaser, and it covers four food groups. I went to lunch last Saturday with Kª (of KK fame, otherwise known as The Lady Downstairs) at The Rooms, St. John’s only museum/archives/art gallery/restaurant. One of the few vegetarian options on the menu was risotto cakes with roasted vegetables in a rosé sauce, so I ordered it, and I enjoyed it thoroughly. The Pie and I kind of have a policy where we won’t order it in a restaurant if we can make it ourselves, and I think this is one of those things that I could easily re-create. I had to think about this for a bit, and do some research. I haven’t made risotto in years and the last time I did so things ended badly. Not only did this risotto have to be well-done, but I had to figure out how to bake it into wedges. I also had to think about the sauce I was going to use. I could just buy some rosé sauce in a jar from the store, but I figure if I was going to take the time and have the patience to make risotto that turned out right, then I was going to make the effort to create an original sauce to put it in. Also, I was on a quest for the right kind of roasting vegetables. 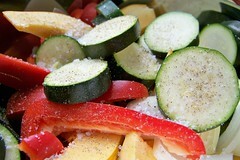 The vegetables I had at the restaurant were red, yellow, and green peppers, with eggplant and I believe zucchini. I was going to do it with red peppers only, onions, zucchini, and butternut squash because I couldn’t find any eggplant anywhere (you make do with what you have, right?). The nice thing about this recipe, I think, is you can do all three parts separately and ahead of time, and then heat the whole thing up later on. Toss in a bowl with pepper and salt. Oiled up like a Turkish oil wrestler. So let’s start with the vegetables. Preheat your oven to 400°F. 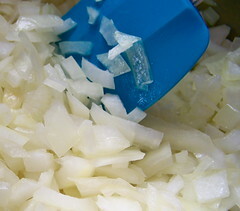 Cut one large onion into eighths and chuck in a large baking pan. Chop 2 small zucchini into thick discs and add it to the pan, along with a red pepper, cut into long thick strips, and one butternut squash, seeds and stringy bits removed, cut into wedges. Season with salt and pepper, and toss with olive oil until all the vegetables are coated. It’s easiest to do the tossing in a bowl, actually. Cover tightly with foil and bake until golden and aromatically soft, about 30 minutes or so. I then uncovered them and baked them for a further 30 minutes so they crispened up a tad. Use your judgment. Leave the vegetables to cool for a bit while you do other things, but leave the oven on. While the vegetables are doing their thing you can start on your sauce. Finely chop about 6 or 7 regular-sized mushrooms. Sauté them in a large pan with a bit of butter and a bit of olive oil (the oil keeps the butter from burning) until brown and tender. 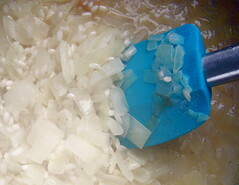 Add 3 or 4 teaspoons of minced garlic (from a jar, because that’s how I roll) and reduce the heat. Add cream and stir carefully. Add a 28oz can (about 800mL) of crushed tomatoes to the pan. 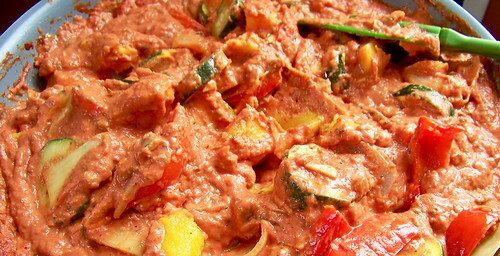 Add a 5oz (150mL) can of tomato paste and mix evenly over medium heat. 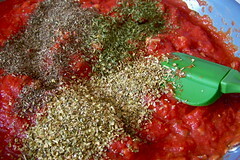 Sprinkle in generous amounts of dried parsley, dried basil, and dried oregano. Let this simmer for about 15 minutes, then add 1/4 to 1/2 cup heavy cream (whipping cream). Alternately, you can use plain yogurt or coconut milk. Stir carefully until fully integrated, then reduce heat to low and leave it like that, stirring occasionally to prevent sticking. Now we can work on that risotto of ours. In a medium saucepan, melt some butter with some olive oil (again, to prevent the butter from burning), and chuck in one whole onion, diced. Sauté that sucker for a little while until translucent. Add in one cup arborio rice (that’s right, it’s not actually called risotto — risotto is what you make out of it), one cup of dry white wine, and a heaping tablespoon of powdered vegetable broth. Stir at high heat and allow the liquid to evaporate. 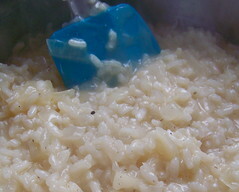 Add one cup boiling (or very hot) water to rice and stir occasionally to release the stuff that sticks to the bottom. After about 3 or 4 minutes, the water will have been absorbed by the rice. Repeat this step twice more, so the total amount of liquid you will have added will be 3 cups of water and one cup of wine. 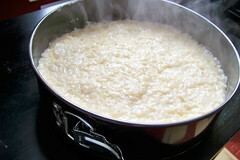 It will take about 20 minutes for the risotto to achieve its signature creamy consistency. While it’s doing that, carefully butter a springform pan and set it aside. 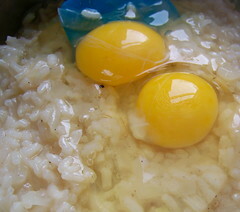 Add 2 tablespoons butter to the rice as well as 3 tablespoons grated romano cheese. Remove from heat and beat in 2 eggs. Quickly stir in the eggs. Bake until set and golden. 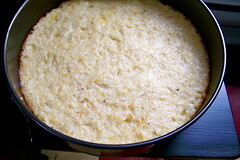 Pour the risotto mixture into the buttered springform pan and level the top. Pop the pan in the oven and bake for 30 to 35 minutes, until the ‘cake’ is firm and golden. Allow to cool for about 15 minutes. Run a soft spatula around the edges of the ‘cake’ and pop it from the springform pan. Allow to cool a bit more, then cut into wedges. Cool and cut into wedges. While the risotto cake is cooling, go back to your vegetables. Peel the skin from the roasted squash and roughly cut the vegetables into bite-sized pieces. Add the vegetables to the rose sauce and heat the whole thing up until it starts to bubble a bit. Heat up the vegetables and sauce. Arrange one or two wedges in a bowl and surround with vegetables and sauce. 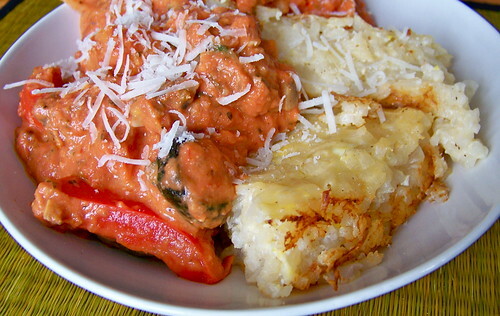 Sprinkle with more grated romano cheese. Serves 4-6. In my mind, these are huevos rancheros, even though I know they’re really not. But it’s easy comfort food and I believe you should be able to call comfort food whatever the heck you want to. Start with your prep. 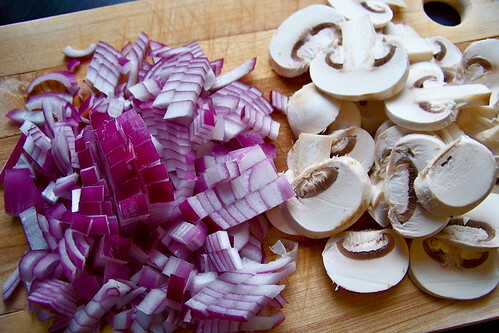 Chop about four medium-sized mushrooms and half a large onion. While you’re at it, preheat the oven to 400°F. 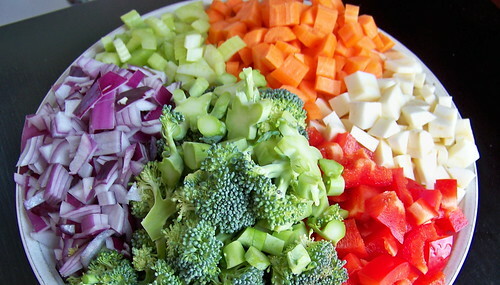 Add whatever vegetables you feel like chopping. 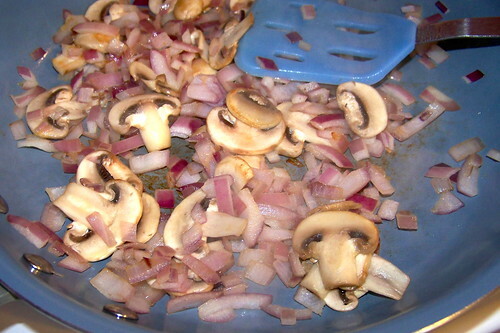 In a cast iron skillet or other pan that can go in the oven, saute the mushrooms and onion with some olive oil until tender. 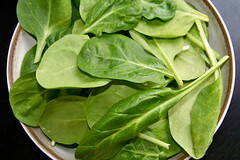 Dump in 1 to 2 cups of baby spinach or chopped regular spinach and allow to wilt. I estimate that this is about a cup and a half. Pour in a jar of spaghetti sauce. My mother uses salsa. Both are good, though perhaps her version is closer to the original. At this point I would also add some extra herbs for spice, but tonight I forgot. Use spaghetti sauce or salsa. Bring to a rapid simmer, stirring frequently, until thoroughly hot all the way through. Carefully crack the eggs into separate areas of the skillet. Carefully crack four eggs into separate places on the skillet. 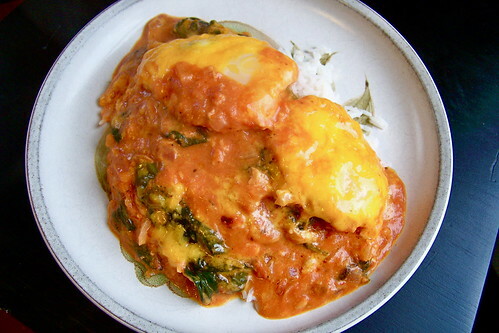 Cook on the stovetop until the whites become milky, then sprinkle with 1 1/2 cups of grated cheddar or mozzerella cheese and bung it in the oven for about ten minutes until the eggs are cooked all the way through and the sauce is all bubbly. 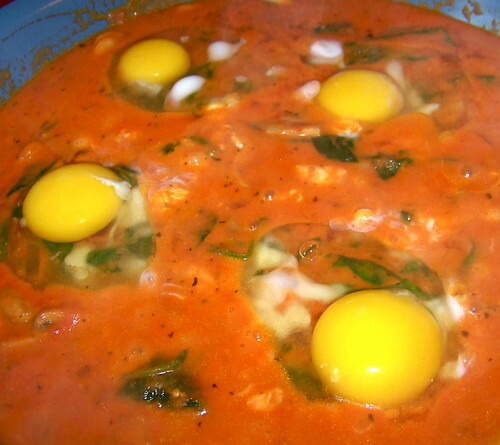 Bake until the eggs are completely cooked. Serve over rice. There’s enough for four, or just two if you’re really hungry, which we were. Serve with rice and eat hot! Our vegetarian experiment is drawing to a close, and I hadn’t yet made a curry. I also had a lot of vegetables in my refrigerator that needed using. In addition, I wanted to take advantage of my new stainless steel compost bin from Lee Valley and cut up a bunch of vegetables. Hoorah. 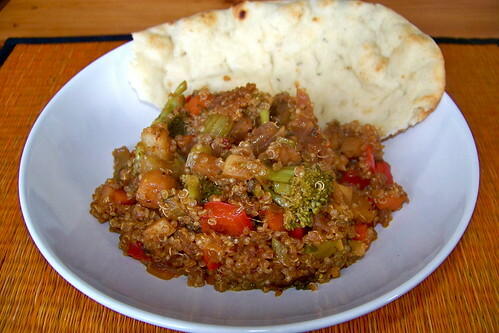 I got the inspiration to make my own curried quinoa from fellow WordPress food blogger Lindsay at The Food Operas. Dice up a medium onion, three medium carrots, three carrot-sized parsnips, a head of broccoli, a red pepper, and two stalks of celery. 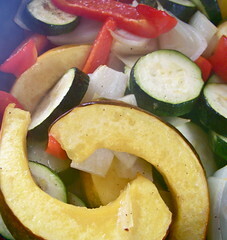 In a large saucepan (preferably one with a wide bottom), heat up some olive oil and chuck in your vegetables. Cook until tender. Pour in two large handfuls of quinoa, together with a can of coconut milk and a few tablespoons each of red curry paste and minced garlic (I like the stuff that comes in jars). Bring to a boil and leave to simmer for 20 minutes. Before serving, add a dash of tamari or soy sauce and some garlic chili sauce to taste. We ate it with some na’an. Mmmm. 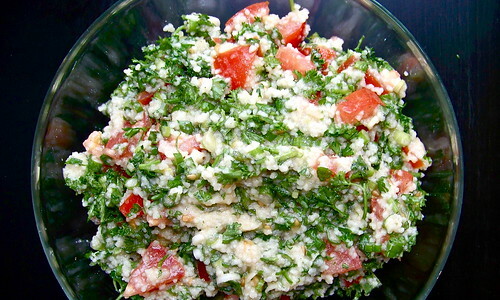 I really like the word tabouleh. I remember eating it often as a kid. It’s a good quick salad and it works well in a pita sandwich. We made this recipe with couscous, but you can substitute it for quinoa or bulgur or other grains. Stir the couscous and oil into the water and allow to expand for 2 minutes. To prepare the couscous, bring a cup of salted water to a boil in a small pot. Remove from the heat and pour in a cup of couscous. Add in 1 tablespoon of olive oil, stir, and allow the pasta to expand for two minutes. Return the couscous to a low heat on the stove. 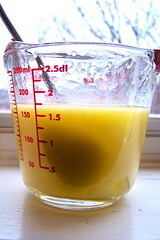 Drop in 2 to 3 teaspoons of butter and stir until well-blended. Allow to cool. 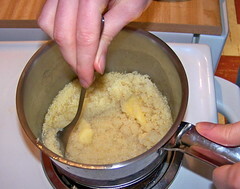 Add butter to couscous and stir on low heat until melted. We got this tabouleh recipe from the Joy of Cooking (2006 edition) by Rombauer & Becker, and we replaced the bulgur with couscous, of course, and we weren’t all that good at measuring, either, so we fiddled with the amounts. 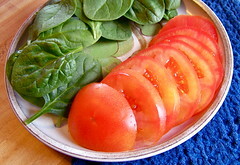 Finely chop 2 to 3 tomatoes, 2 cups of fresh parsley, 1 cup of fresh mint, and 1 bunch of scallions or green onions. See my tips and tricks entry on how to finely chop herbs. 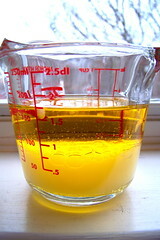 In a small bowl or measuring cup, emulsify 1/3 cup olive oil with 1/3 cup lemon juice. To do this, I took a very small whisk and rubbed it between my palms until the liquid was creamy and custard coloured. Use a small whisk to emulsify the ingredients. 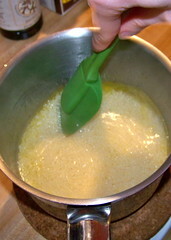 Rub the whisk briskly between your palms until the liquid is custardy. 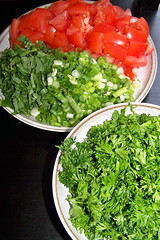 In a large bowl, mix the couscous, tomatoes, onions, and herbs together thoroughly. Toss with the olive oil/lemon juice emulsion and serve. Serve as a salad or in a sandwich. We spooned the tabouleh into open pita pockets lined with baby spinach and home-made hummus and ate them with Garbage Soup. 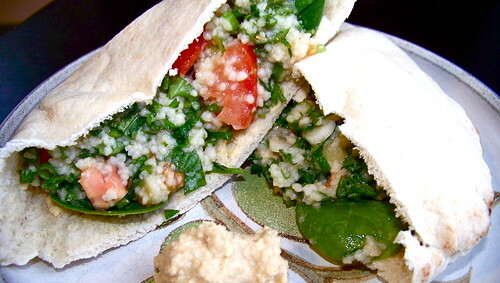 Pita pockets with hummus, tabouleh, and baby spinach. New DIYs as often as I can get them to you, whether you like it or not. Ali Does It Herself Create a free website or blog at WordPress.com.